All the table functions included in this beta release are explained in the downloadable user guide (pdf file). There are also useful notes for VBA and .NET developers in this visual guide. As an Excel user, you can use the table functions for various purposes. As an Excel programmer, you can call the matrix, vector and table functions of Finaquant Calcs in VBA to develop some powerful macros. As an Excel and .NET programmer you can develop new table functions for your applications, and make them available in Excel. I think, the transition from VBA to a .NET language like VB.NET should not be too difficult for an excel programmer. Any questions? Need training or project support? You may direct your questions and comments to Finaquant Community Forum. If nobody answers, I (Tunc) personally try to answer every question within a week or so. 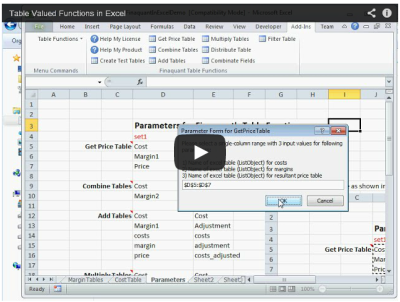 Do you need training for using the table functions of finaquant? As far as i have understood, with this xls add-in, we will have a set of mathematical, financial, statistics etc… functions, which will take as input and output parameter, excel tables. This looks like a nice enhancement to excel formulas, which only support few build in functions with xls tables input, like vlookup, hlookup and which doesn’t support at all, functions with table output. But, if i understood correctly, from your first demo version, there is no way to see which table has been created by which table function (functionality brought by xls formula bar, for xls cells) and it is not possible to refresh output table data manually or automatically, if one of its source tables, has been updated (for analogy; excel, does this automatically, for cells with formula). I believe that these 2 features will be exteremely useful for usability of “excel functions with tables parameters” add-in. My question is simple; Do you have any plan, about adding these features or some similar functionality, to productive version of your add-in? New release B104 of excel add-in (Finaquant in Excel) is available for download.